Ultra fast curing U.V. wader repair product activated by sunlight. Flexible, solvent free formula. 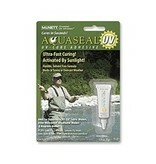 Ideal for repairing Gore-Tex fabric waders, microfiber waders, and neopreen waders. Also can be used to coat fly line knots, cements fly heads, seals leaks in tents and inflatable sleeping pads etc. Net wt. ¼ oz. 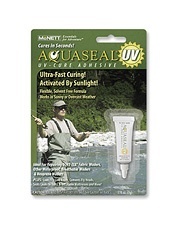 This is the fastest “in the field” UV wader repair adhesive for a quick fix. Standard Aquaseal is still needed for a permanent repair.